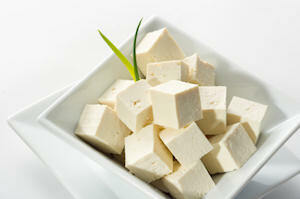 'Tofu' is the name for bean curd, which is a vegetarian product often used in place of meat. It's often referred to as 'meat without bones' and is known for being like a sponge in that it can soak up flavours really well. It's often used in Asian and Indian cooking, as it absorbs spices and seasonings well, although it's used all over the world as a high-protein addition to all sorts of dishes, including soups, sauces, dressings, desserts, salads and stir fries. Tofu is also very low in fat, low in calories and jam packed with protein, making it perfect for the health concious foodie. We have lots of tofu recipes below, including tofu vindaloo, tofu mocha cake and sesame tofu noodles. You can buy tofu in all sorts of incarnations, and which type you buy depends entirely on what you plan to do with it. Firm or extra firm tofu is usually used when you want the tofu to stand up on its own — i.e. in a stir fry or curry, without falling apart or being absorbed into the sauce. It's also good for being grilled or fried. Silken tofu, however, is softer and so is often used for soups, salad dressings, sauces and puddings. It's also used in place of egg whites and cream in things like mousses and soufflés. Fermented tofu, smoked tofu and pressed seasoned tofu are also available and are excellent choices if you want a little extra flavour from your tofu. Be sure to drain your tofu thoroughly before using it, unless the recipe states that you should use the tofu undrained, so that your dish doesn't end up too watery. For lots of tasty tofu recipes, take a look above — we've got starters, mains, puddings and sauces.